Versatility abounds here as the EJ1 is used for jazz, teaching, workout, and social dance. It is sturdy, featuring durable leather, a non slip heel counter, and reinforced eyelets. Nicely padded, with an Achilles notch and cotton lining, it is quite comfortable. Little dancers can leave a bit of growing room and still have a nice fit. 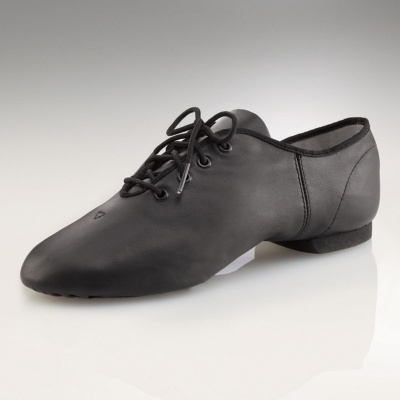 The Capezio E-Series Jazz Oxford shoes are available in Child sizes 10-1.5 and Adult sizes 3-14. Limited sizes available in Wide width while supplies last. Ladies and children begin with street shoe size. Men should begin 2 sizes up. Please note that children's shoes are cut wider and a Size 1 Child is comparable to a Size 3 Adult.